This chalet is only available to guests booking the whole chalet for sole use. Le Vieux Crêt has probably become Val d'Isère's most des res chalet for eight to ten guests. The chalet hasn't changed. It is still one of Val d'Isère's only genuinely old buildings, being part of the 1620s farmhouse which also contains our Maison du Rocher. Its walls are as thick as ever, its granite roof as heavy, though you probably won't see that under a metre or so of snow. The huge, high-ceilinged sitting room is still wonderfully comfortable, with its log fire, multi-channel surround-sound satellite TV, DVDs, Wifi etc. There is a separate dining room, and a mezzanine where ninth and tenth guests can stay half-price. Le Vieux Crêt is in a brilliant position, in that collection of lovely wood-and-stone chalets just on the left as one reaches Val d'Isère proper from La Daille. 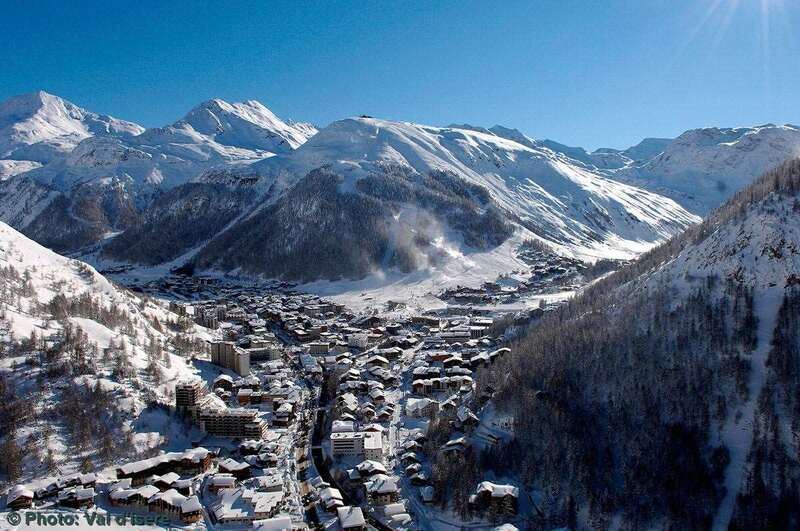 The hamlet is called le Crêt - the Ridge - and is considered the Boltons of Val d'Isère (not to be confused with the Bolton). Le Vieux Crêt is at the sunny front, and although its garden wall overhangs the road 50m away and 10m below, there is seldom a sound. There is a steepish little path to the road, with bus stops to the Funival and village centre a further 100m or so. If you chose to walk, either would take ten minutes. Please note that the use of the sauna in Le Vieux Crêt is at your own risk (and that of your party members). We cannot accept responsibility for any accidents/injuries which occur during the use of the sauna. Children must be supervised when using the sauna. Part of a beautifully refurbished 1620s farmhouse. Some rooms give option of twin beds or six-foot doubles (please specify which you prefer when booking). Vast sitting room with log fire, satellite TV, DVD, surround sound. Silent, sunny position on edge of Val d’Isère village, ten minutes’ walk from centre or Funival. Private Land Rover shuttle shared with next door chalets La Maison du Rocher and La Croix. A chef and an assistant, one of whom lives in a self-contained ground-floor studio. The other lives out. Double (10' x 11') on first floor. Bathroom with wc. Twin/double (9' x 9') on first floor. Bathroom with wc. Twin/double (13' x 8') on first floor. Bathroom with wc. Double (11' x 8'6") on ground floor with bathroom (small bath) and separate wc. (20' x 20') On the top floor. Enormous, high-ceilinged room. Fireplace, DVD, satellite TV (all major channels), fridge for your hooch. Mezzanine with two pull-out beds. Large south-facing balcony. WiFi. (12' x 12'6") Next to sitting room. Open-plan kitchen not included in measurements. Mezzanine (13' x 13') with twin sofa beds (extra wc and basin between sitting and dining rooms). The cost for these extra bed is half the quoted Vieux Cret price (not including any transport) and 80% of the quoted price if a flight and transfer are required. On certain dates we may not be able to provide a flight for an extra bed. On ground floor with further shower. Afternoon tea and Dinner on six nights of the week. Please note: The chalet host will have a day off during the course of the week, during which you will be required to eat out.